» Characters from DFW #5: SECRET AGENT GEORGE DEVRITE — by Monte Herridge. Characters from DFW #5: SECRET AGENT GEORGE DEVRITE — by Monte Herridge. #5. SECRET AGENT GEORGE DEVRITE, by Tom Curry. The Secret Agent George Devrite stories by Tom Curry were a short series of seven stories published in Detective Fiction Weekly from 1936 to 1940. These reports often consist of factual accounts of their actions and gives recommendations to Hallihan of what to do – people to investigate, arrest, or otherwise take action about. Devrite “received credit only in the secret records of the Police.” (The Donkey’s Head) He lived in a small apartment in the West Forties, and had no close friends, as his job did not allow such. As to entertainment, Devrite derived “his main amusement … in solving the puzzles presented by Hallihan.” (The Donkey’s Head) So Devrite could be described as a workaholic who lived for his job. In the first story in the series, “The Green Fingers of Death,” one of Devrite’s fellow agents has been found murdered, and Hallihan gives the case that he was working on to Devrite to investigate. It involves a young bank clerk named Robert Evans, who is in some sort of trouble. Devrite does some investigating and finds that Evans owes a gambling debt to a German named Count von Hult. Hult wants something unknown in return for this debt, which turns out to be passing counterfeit money at his bank. Devrite tracks down the counterfeiters and his earlier report to Hallihan set the police on their track too. 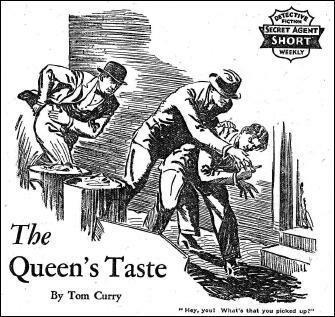 The second story in the series, “The Queen’s Taste” involves Devrite in investigating a murder case. The police haven’t been able to solve the case satisfactorily, so Inspector Hallihan puts George Devrite on the case. The police think they know who committed the murder, and Devrite winds up agreeing with them. The culprit is a Cuban named Luis Ortez, a former triggerman turned dancer at the Peacock Cabaret. His dancing partner is the murdered man’s daughter, Adele Morris. Ortez is interested in Adele Morris, and part of Hallihan’s instructions to Devrite stressed that he was to see what he could do to stop this interest. Devrite runs into the usual danger in this case, barely escaping with his life after gunmen target him. 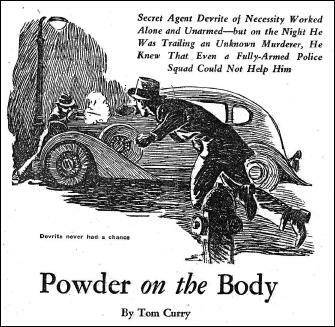 “Powder on the Body” is the third story, and Devrite is assigned to investigate a series of murders after the police come up with a dead end. Each of the victims is well-off, each has talcum powder on his suit, and each has been robbed and shot at close range. One more victim is killed while Devrite is investigating, making him more determined than ever to solve the case. The victims all went to a night club called the Blue Belle before they were killed, so Devrite starts there. As usual in this series, Devrite comes near death in his attempt to get to the bottom of the murders. 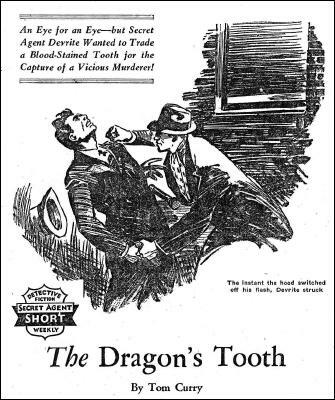 In “The Dragon’s Tooth” Devrite investigates the murder of William Brennan of Brennan and Kanes, furriers. Also he was to track down the $250,000 worth of furs stolen at the same time. Devrite infiltrates the underworld to a slight degree in this one, and gains some information that sets him on the trail of the solution to the crimes. Not only does Devrite’s work clear up the murder, but it also breaks up a criminal gang of fur thieves and put a number of its members in jail. “The Visit of Death” involves Devrite in still another murder case, that of Daniel Moresby, rich recluse. The only clue to the murderer is a chunk of lead, which turned out to be a railroad freight car seal. So Devrite puts on some old clothes and goes to the hobo encampment near the railroad tracks, hoping to find further clues and some information. He finds more than he bargained for, as the murderer and a companion show up at the encampment. “The Donkey’s Head” finds George Devrite investigating another murder, that of Keith Mortimer, a fairly young rich man who lived an idle life. Other than a possible burglar, there are only two suspects in the case so it is a matter of tracking down clues on each suspect. Devrite has his life saved by one of the suspects, and becomes indebted to him for that to the point where he is temporarily unwilling to investigate further. However, his work ethic convinces him to continue the investigation. The title of the story refers to the murdered man’s broken Chinese vase, which is in a hundred pieces when Devrite and Hallihan see it. However, a small piece showing a donkey’s head is missing from the reconstructed vase and provides a clue to the murder. “Racket Kill” is the last story in the series, and was published over 2 ½ years after the previous story. Kenneth Harris, a Bronx garage owner, has been murdered racketeer style. Hallihan instructs Devrite to investigate. The only suspects are Harris’ partner, Jerry Sessler, and the local racketeers who peddle stolen auto parts to the garages. Devrite almost immediately gets into trouble with the racketeers, and has to talk fast to get out of it. This is an average series, with some very good stories, but mostly average or slightly above that. There is no element of humor in the stories, and the hardboiled nature of the stories denies any lightness to them. This series is better than other stand-alone stories about undercover police that was published in DFW. [**] This story has been added later, thanks to Ron Smyth who discovered its existence and told us about it in the comments. Not only that, but it can be read online at http://www.unz.org. Follow the link to the website, next to the Detective Fiction Weekly page, then to the issue itself. It’s a shame that many of these authors have so little information available. For instance Tom Curry wrote quite a bit for the pulps and ARGOSY in the December 29, 1934 issue had an entry on him in their MEN WHO MAKE THE ARGOSY series. Often these biographical sketches are inaccurate or even a pack of lies like with the Max Brand pseudonyms. But Curry’s sounds halfway true. He was a newpaper reporter for awhile and picked up alot of experience hanging around the police stations. His full name was Thomas Albert Curry(1900-1976) and Mike Cancellari’s CHECKLIST OF WESTERN AND NORTHERN FICTION, 1900-1980, lists 20 western hardcovers by Curry. Here’s some more information about Curry, although nothing about him personally. All reprints from the western hero pulps, as indicated. I’m probably missing a few. 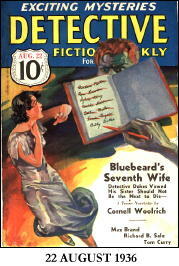 An anthology contains “The Sign” (1940) by Curry. It’s a good Western-mystery hybrid, set in the desert like Erle Stanley Gardner’s “Whispering Sands” stories. Read and liked this a long time ago. Have always meant to try to track down more Curry. Hmm. Curry had a seven-story series in Black Mask in 1928 about “Francis DeVrite,” whose set-up is almost exactly the same as George DeVrite’s. I guess Curry decided to recycle. I think you’re onto something there, Jess. Good catch! Thanks for the information, Jess. That sounds interesting. Maybe eventually someone will write about the earlier series. I certainly can’t afford to buy those early issues of Black Mask. I wonder if the plots of the earlier stories were recycled for the later series. “The Art Treasure Murders” is actually by Robert Sidney Bowen, not Tom Curry. John L. Benton was a house name used by the Thrilling line. I have the original pulp printing of the story under Bowen’s name, as well as the 1940 Gateway hardback. The pulp story was about 45 – 50,000 words, but I believe the Gateway edition was around 60,000 words. I also have the Gateway edition of John L. Benton’s “Talent For Murder”, which is a regular murder mystery. It doesn’t read like Tom Curry or Robert Sidney Bowen, but who knows. The Thrilling Group was publishing some of their pulp novels in Gateway, and using house names instead of the author’s real name. Plus, they changed the title of the novel in most cases, if not all. Hope this helps. Yes, it certainly does help, Tom. Thanks! I’ll pass your information on to Al Hubin for his Crime Fiction bibliography, which is where I got the information I used in Comment #2. Hi. I found your site while researching my family’s history. I can add a tiny biographical detail, if it’s of interest. Tom Curry was the brother-in-law of F. R. Buckley (Frederick Robert) who was a quite prolific author of pulp Western fiction in the 20s/30s, as well as having written for the very early cinema and subsequently writing in other fields.Buckley and his wife lived for some time with Thomas Curry at the Curry family home and may well have influenced him, being slightly older and a better established writer. Thomas brought up F.R.B’s daughter after the tragic suicide of Helen Buckley, his sister. Biographical details such as this are always of interest and welcome, Susan. Thanks very much! There is a Secret Agent George Devrite story from the September 5 1936 issue of DFW online at http://www.unz.org titled “Lion Face” as well. Thanks, Ron. You have good eyes to have spotted this. Not only did you find a missing story, but it’s one that everyone can go and actually read. I’ll add it to Monte’s bibliography for Devrite right away!